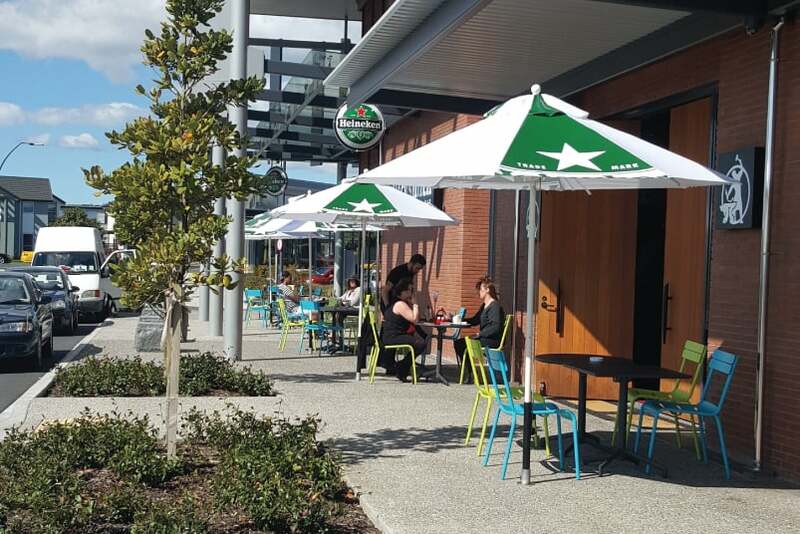 DB Breweries world renown beer brand Heineken have used Shade7 to supply branded umbrellas for their marketing mix, giving great brand exposure with printed umbrellas. Heineken is a household name in the beer industry and protecting this reputation is important. DB Breweries proudly brew Heineken under licence at their Waitemata Brewery in Auckland and manage the brand in New Zealand. After recently updating their branding, Heineken have needed to ensure that their brand remains uniform across all marketing platforms. Heineken begun brewing in 1873 in the Netherlands and has become the world’s number one premium beer. It is more important than ever to maintain this recognisable brand with their marketing mix and after updating their brand recently it has required them to update a wide range of materials and media. One of the recipients of this new branding is Auckland based eatery and bar ‘The Blacksmith’. The outdoor area of this establishment are now home to 7 Heineken printed umbrellas. Shade experts Shade7 have supplied 7 of their fibreglass umbrellas featuring unique full panel printing. The Shade7 Fibreglass umbrella is a commercial umbrella designed to be durable and offer brand exposure at the same time. It is lightweight yet extremely strong. The canopy arms are made from fibreglass, allowing them to flex and bend in windy and rough environments. In the same way that a fishing rod will bend under pressure, the fibreglass canopy arms are designed to do the same thing. These outdoor umbrellas have also been designed to live outside and withstand strong winds, rain and sunshine without rusting. Shade7’s fibreglass outdoor umbrellas are available commercially in either a 1.9m Square (3.6m² of shade) or 2.7m Octagonal (5.2m² of shade) umbrella. There are three different canopy fabric options and several base options to choose from depending on the requirements. The team at Shade7 also offer a printing and branding service to ensure that a brand is being presented well. One of the great benefits of Shade7’s printing process is that printing can be done right to the edge of the canopy panels, as has been done with the Heineken printed umbrellas. For further information on commercial printed umbrellas please contact the team at Shade7.